Distance running was not a hobby that Albion College History Professor Marcy Sacks had envisioned for herself. In fact, soccer had been Sacks’ primary sport, until an ACL injury called for surgery and an end to her career. Fast forward to last Monday, where Sacks’ training culminated in her tenth consecutive Boston Marathon finish. “After going through physical therapy, I found that I was able to start running a lot more than I could before I tore my ACL. I wasn’t competitive at the beginning; I just wanted to get in shape,” said Sacks. It did not take Sacks very long to realize that she had a hidden talent for the sport of running. This prompted her to start competing in many different road races, specifically marathons. She battled the beast of the marathon in Grand Rapids, finishing the race with the immediate motivation to run another marathon, except with more training and preparation. However, this did not go without its challenges. 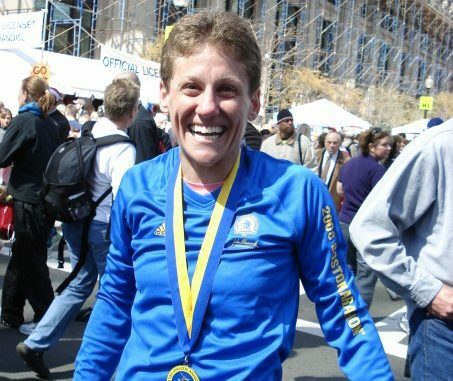 Sacks completed the next Boston Marathon in 2008, and from there, her competitive juices really started to flow. She aimed to become a better runner each year she toed the starting line on Boston’s Route 135. As Sacks put it, “the bug totally bit.” This bite soon evolved into a fantastic streak of marathon completions, specifically highlighted by her tenth consecutive finish this year. She also recalls some of the more transformative moments in her Boston Marathon career, especially her fifth time running the race. Her perseverance was also evident after the infamous 2013 Boston Marathon, where the event was halted by a terrorist attack. This, however, did not scare Sacks away from competing the next year. From there, Sacks’ motivation came in the form of finishing a decade of Boston Marathons. Her goal was realized last Monday, when she crossed the finish line on Boylston Street for the tenth time in a row. Sacks admits that it was not her best race, given that she is currently battling some knee issues, but is still proud of the achievement. Finishing a decade of Boston Marathons is not only a personal achievement but one that is also recognized by the Boston Athletic Association, which organizes the race. While Sacks’ future in running is currently in question due to her knee, she knows that running is something she will continue to pursue if she is physically able. “I’m even looking at marathons to run in the next few weeks,” joked Sacks. Photo courtesy of Marcy Sacks.